Straus News has named Alexis Gelber editor in chief. 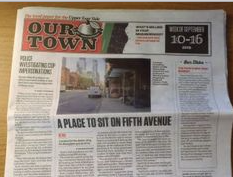 Straus publishes several local newspapers, including Our Town and Chelsea News. Gelber has most recently served as an adjunct professor at NYU, a role she’ll continue. She previously spent more than two decades with Newsweek. Gelber succeeds Kyle Pope, who was named editor of CJR in late June.